The exhibit that opened yesterday at the Newark Public Library, marking the 75th anniversary of the New Jersey Symphony Orchestra, salutes a major American musical institution. Over the years, the symphony has moved about the state, calling several regional centers and nearly 200 New Jersey municipalities, at one time or another, its home. Newark, where the organization has offices and has played hundreds of concerts, has a particularly important vantage point in that rich history. Indeed, there are many aspects of the New Jersey Symphony Orchestra that make it unique. The orchestra was born performing around the state, but it traces its origins to Newark, Orange and Montclair. During a star-studded history, the symphony has been conducted by a dozen leaders, each of whom has left a distinct musical imprint on the organization. At the same time, the women of the symphony have acted as performers, participants and patronesses, more so than in the life of any other American orchestra. Women, in fact, built and molded it, rather than assuming the roles of mere tokens or graces. Because the orchestra has shared its concert stage with many of Europe's and America's most talented musical artists, the list of performers reads like a blue book of classical and popular American music. This October 18 will mark the beginning of a new era for the orchestra, when the doors at the New Jersey Performing Arts Center in Newark swing open. At that time, the term 'Renaissance Newark' will assume yet another meaning. The future of Newark and the region will look even brighter as an even greater array of musicians, dancers, and all manner of performing artists come calling at the state's largest concert hall. Little did those 17th century Puritans of so long ago who landed on the very spot where the arts center is rising know that a great city would be reborn on that very spot — dedicated to the arts and humanities and the soaring of the human spirit. Jean-Rae Turner, co-curator of the library exhibition, 'In Harmony for Seventy-Five Years, The New Jersey Symphony Orchestra, 1922-1997,' has researched and written about the organization's past and produced a well-rounded review of the orchestra, hundreds of photos of the past, and a chronology of its varied state and local accomplishments. Although we celebrate the beginning of the New Jersey Symphony Orchestra in 1922, several organizations preceded the founding date by many years. The Eintracht Singing Society was a men's choir, established in 1846. By 1872, it had acquired an instrumental element and was renamed the Eintracht Singing and Orchestra Society. By the 1920s, it became part of the Haydn Orchestra of the Oranges. By 1917, the Llewellyn Ensemble came into existence as a chamber music group. On May 15, 1922, the singers were invited to perform at the Montclair Art Museum. The Llewellyn Ensemble added a conductor. For a November 29, 1922, performance, the group was rechristened the Montclair Orchestra. In 1926-27 it became the New Jersey Orchestra, joined during the 1928-29 season by the Haydn Orchestra. In 1937, the musicians became the New Jersey Symphony Orchestra, a name that has prevailed for 60 years. The orchestra's first conductor was Philip James (l922-1929), a composer, choirmaster and organist at St. Luke's Episcopal Church in Montclair. Prominent musicians associated with him included composer Percy Grainger and cellist Pablo Casals. During James' tenure with the orchestra, concerts were held in Montclair at Mt. Hebron School, and in Orange High School. In 1925, the orchestra took part in the Newark Festival, for which it gained wide recognition. Rene Pollain (1929-1940) took over as the second conductor from 1919 to 1929. During his tenure, he added professional musicians where amateurs had once played. Pollain also worked with the New York Philharmonic, but made certain that performances of the two groups were not scheduled for the same evenings. In 1939, he traveled to France, where he died under mysterious circumstances the following year. Dr. Frieder Weissman (1940-1947), the third conductor, had been a substitute conductor. He was appointed to the permanent post in September 1940. Bavarian-born and educated in law and music, he received his Ph.D. in Munich. From 1920-25, Weissman was a successful pianist, conductor, and composer with the Berlin State Opera. He subsequently appeared with the Konigsberg Opera and orchestras throughout Europe. In 1935, he came to the United States, and became well-known for several commercial recordings of symphonies and operas. Weissman introduced the music of Latin American composers into the New Jersey Symphony Orchestra's repertoire. He retired in 1947. Dr. Samuel Antek (1947-1958), violinist and concert master under Pollain, was the symphony's fourth director. Under his direction, the orchestra began sponsoring young people's activities. In 1948, it began broadcasting on radio station WNJR. About the same time, the orchestra joined with the Paper Mill Playhouse to present the first Summer Music Festival. In 1958, under Pollain's baton, the Friends of the New Jersey Symphony Orchestra was formed. Matyas Abas (1958-1960) was the orchestra's fifth director. A native of Holland, he escaped from Buchenwald during the war. In 1951, before coming to America, he became a violinist with the Rotterdam Symphony. In the United States, he settled in Texas and Iowa before joining the New Jersey Symphony Orchestra. His career culminated with the appearance of Beverly Sills. Kenneth Schermerhorn (1962-1968) was the sixth director. A large grant from the Ford Foundation enabled the New Jersey Symphony Orchestra to engage in many children's programs. Roger Sessions' Sixth Symphony premiered in 1966, and Ulysses Kay's Inscriptions from Whitman was produced in 1964. New Jersey Symphony Orchestra concerts were broadcast from the Mosque (Symphony Hall). Often, the Newark Boy's Chorus was part of the program. Henry Lewis (1968-1970) was the first African-American conductor of a major American orchestra. His outdoor concerts in the 1960s at Untermann Field in Newark near Weequahic High School was a first for the organization. High standards and national recognition were the hallmarks of Lewis' tenure. The Lewis family — rounded out by his wife, the world-famous soprano Marilyn Home, and daughter Angela — lived in the nearby suburb of Orange. Max Rudolf (1976-1977), a German native and the New Jersey Symphony Orchestra's eighth director, was a former conductor of the Metropolitan Opera Company orchestra and the Cincinnati Symphony. Thomas Michalak (1977-1983), ninth director, was born in Poland. He won national attention for the PBS telecast of Gershwin and Song, featuring Newark's own Sarah Vaughan, for which she won an Emmy. 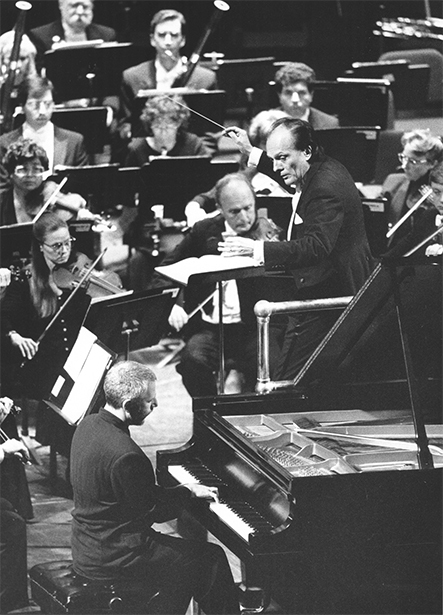 George Manahan served as the orchestra's musical director from 1983-85 and 1986-89. Hugh Wolff (1985-1986) was just 31 when he was appointed as the New Jersey Symphony Orchestra's youngest director. Like Lewis, he is credited with bringing national attention to the orchestra. At present, he is the director of the St. Paul Chamber Orchestra. Zdenek Macal (1992- ), the present maestro, is a native of Czechoslovakia. He won international attention in the International Conducting Competition in France in 1966. A musician of international stature, he began recording CDs with the orchestra, thus adding to the American music literature. The New Jersey Symphony Orchestra is truly a statewide musical organization, but its home base is Newark. The orchestra's first home was the old Mosque Theatre, later renamed Symphony Hall. Originally built as the Salaam Temple, A.A.O.N.M.S., in 1925 for $2 million, the hall was dedicated in April 1926. Known as the Mosque from the 1930s through the 1950s, the hall was operated by the Griffith Music Foundation with the help of the foundation's sponsor, Lena Griffith — a great lady who kept high culture alive in Newark in the difficult Great Depression years. Griffith, the former Lena Donaldson of Union, Iowa, and her husband operated the Griffith Piano Co. on Broad Street, a Newark landmark. For years, they lavished money on local cultural projects, sponsoring the Newark School Stadium concerts, which drew more than 20,000, and classical concerts at the Mosque. A former Essex County freeholder, and treasurer of the National Conference of Christians and Jews, Griffith also helped organize the Essex County Symphony Society. She brought many world-renowned artists to Newark. Most great musicians of the concert world, in fact, played for Newark audiences under her management. That number included Arturo Toscanini and the NBC Symphony Orchestra, the Metropolitan Opera Company, Marian Anderson, Paderewski, Rachmanin-off, Horowitz, Menuhin, Heifetz, the Ballet Russe de Monte Carlo, the New York Philharmonic and the Philadelphia and Boston symphonies. While Mrs. Griffith's death brought an end to the Griffith musical tradition, the performances she and her husband sponsored will live on in the minds of the many thousands who enjoyed those glorious years. In 1964, Newark acquired the Mosque building, leasing it the following year to the New Jersey Symphony. Now, a new home for the orchestra will be ready for use in October. Hopefully, too, the old Mosque — today's Symphony Hall — will live on. Just as New York has Carnegie Hall and Lincoln Center, Newark will have two stellar music facilities — New Jersey Performing Arts Center at one end of Broad Street and Newark Symphony Hall on the opposite end. As the New Jersey Symphony Orchestra begins the final quarter of its first century, and as the city and region prepare for a new millennium, the cultural future truly looks exciting.